The Longest Marriage Ever! Husband-108, Wife-105, Celebrate 82 years of Marriage! 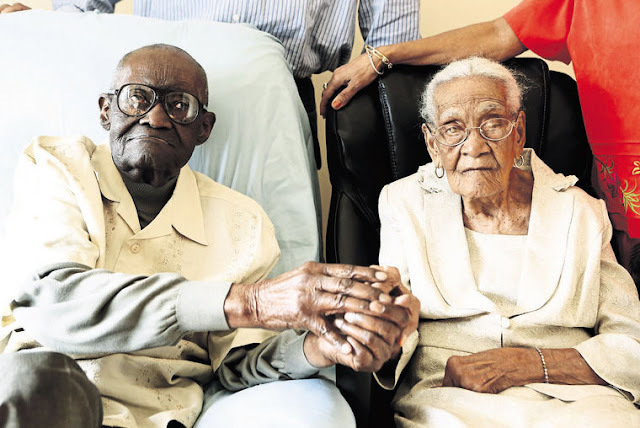 Rockland County has the oldest married couple in the world. Duranord and Jeanne Veillard are married for 82 years and no they will celebrate their next anniversary in a very special way. This couple is part of the very rich history of the County and has seen a lot of things changing since they’re together. Both of them have combined age of 202 years. The husband Duranord is 109 years while his wife Jeanne 105. Jeanne said yes in November 1936, that is the time when Franklin D. Roosevelt entered the office. As they say to the reporter, they never expected to live so long and that would have large 83 years marriage. Duranord comes from a fishermen’s family from St. Louis du Sud. He spends his young years in Les Cayes in Southern Haiti but lived in Port – Au – Prince and studied law. later on, they moved to the United States in 1968 because Duranord lost his job as a judge. They found their peace in Spring Valley where they settled and had 5 children. Here Duranord worked as a lab technician at the Good Samaritan Hospital. For the celebration, he was dressed in matching crisping white guayabera with brown slacks and brown leather shoes. Jeanne and Duranord say that it is a blessing having your life partner by your side for so long. Duranord joked, he said I wouldn’t last a day without Jeanne, she is probably the reason why I’m still alive. At their celebration, they ware telling jokes and holding the American flag. They also mentioned that one of the best things that ever happened to them is moving in the United States. Duranord said said that since they moved here, they ware instantly accepted in the county.